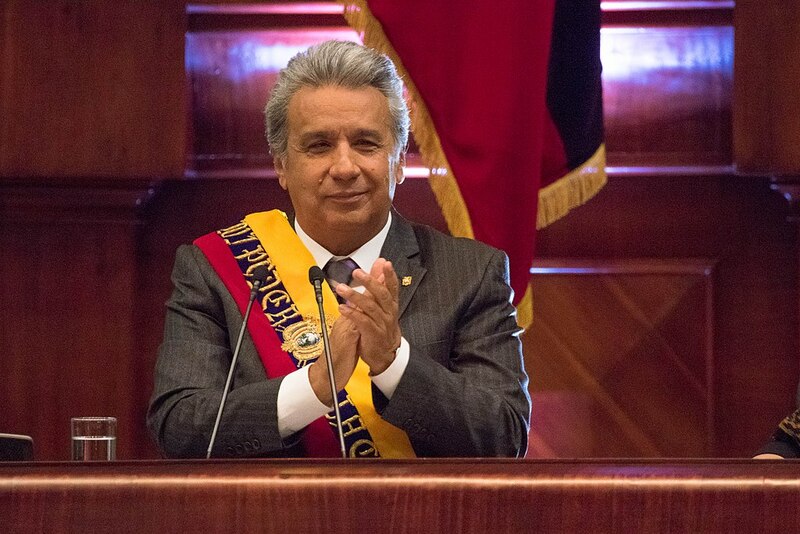 Ecuador's Lenín Moreno has allied with former political opponents to implement a conservative economic agenda, threatening to undo the country’s strides in tackling poverty and inequality under Rafael Correa. Are social conditions in Ecuador beginning to deteriorate? A report released in June 2018 on poverty and inequality by Ecuador’s National Institute of Statistics and Census found that poverty crept up slightly between June 2017 and June 2018, with 24.5 percent of the population living in poverty, up from 23.1 percent the year before. While these numbers may appear low, they could be a sign of things to come as the Ecuadorian government under Lenín Moreno doubles down on economic policies favoring austerity and deregulation while attempting to discredit the Left. The political and economic prognosis appeared quite different when Moreno was elected in April 2017, representing the center-left ruling party, Alianza País (Country Alliance), narrowly defeating neoliberal banker Guillermo Lasso. The Latin American left, against the backdrop of a resurgent Right turn, was relieved: onlookers expected Moreno to continue the progressive advances his predecessor, Rafael Correa, had made during his tenure in office under the Citizens’ Revolution, with perhaps a softer edge. But once in office, Moreno swiftly pivoted on his campaign promises, governing with a right-wing neoliberal agenda that has already chipped away at the gains of the Citizens’ Revolution and could threaten to bury it entirely. Alianza País is now split. Moreno, who served as Correa’s vice president from 2007 to 2013, has changed the party leadership and its priorities. Correa and his supporters left the party in January 2018 and have not been allowed to form their own party structures since. Meanwhile, under Moreno’s leadership, Alianza País has lost much of its previous support. Since his inauguration, Moreno has claimed his government inherited an economic and institutional crisis, presenting neoliberal adjustment policies and austerity as the solution. In the process, Moreno and his allies have lambasted Correa-era infrastructure projects as examples of government corruption and mismanagement as well as cornerstone education and technology projects, such as the innovation hub known as Yachay City of Knowledge. He also cautioned that the recently refurbished oil refinery in Esmeraldas was severely damaged — its scheduled temporary shutdown was postponed repeatedly until it was finally enacted in March 2019. Moreno has claimed that Correa installed a camera in the presidential palace to monitor his every move. The new authorities also tried to put Correa on trial on numerous occasions in a clear attempt of political persecution. One of the attempts was to put Correa on trial for kidnapping without noteworthy evidence. Interpol failed to issue a red alert notice citing human rights. Far from a personal feud between two leading politicians, less than two years into his term in office Moreno has proven that, despite being elected as a candidate of the Left, his government is executing a right-wing agenda. The Citizens’ Revolution, led by Rafael Correa from 2007 to 2017, followed a period of high instability and dissatisfaction with the neoliberal development model. Influential and politically well-connected business groups were able to negotiate special regulations and capture rents through cartels and monopolies. Between 1996 and 2006, no elected president had been able to complete his term of office. In the late 1990s, Ecuador slid into a severe crisis following financial deregulation. Economic output plummeted and the state shelled out billions to rescue the banks. Then-President Jamil Mahuad, whose government had close ties with the financial sector, was eventually overthrown in a popular uprising in early 2000, shortly after announcing the country’s official dollarization. Even before the crisis, inequality had increased massively. In the period between 1999 and 2005, hundreds of thousands of Ecuadorians left the country, mainly to Spain and the United States. The remittances they sent home, along with rising oil revenues, were essential to economic recovery. However, while economic crisis eased, political instability continued. In 2005, the next elected president, Lucio Gutiérrez, was toppled. The slogan “Que se vayan todos”, or “Out with them all,” illustrated that protests took aim at the entire political-economic establishment. Rafael Correa’s election marked a fundamental change in Ecuadorian politics. His Citizens’ Revolution passed one of the world’s most progressive constitutions in 2008, approved by popular vote in 2008. The new constitution marked a clear departure from neoliberalism by enshrining the principle of good living, or buen vivir in Spanish or sumak kawsay in Quechua, and emphasized social and cultural rights, a stronger role of the state, and socially and environmentally sustainable development. Given the dissatisfaction with the established party system and its ties to business elites, Correa’s actions to limit the influence of the special interest groups were highly popular. His approval rating was close to 74 percent in 2007 and only dropped below 50 percent in 2016, according to Latinobarometro. The Correa government owed much of its popularity to its massive investments in public infrastructure, roads, hydroelectric power plants, schools, health centers, and other projects. In order to reduce reliance on volatile oil revenues, the government spearheaded a fight against tax evasion and avoidance, leading to significant increases in fiscal revenues including social security from 12.7 percent in 2006 to 20.5 percent in 2015. Oil revenues were no longer invested abroad for low returns at home, but used to strengthen social and economic infrastructure in Ecuador. Many of these investments help to stabilize today’s foreign trade balance. Ecuador’s per capita economic growth averaged 1.5 percent between 2006 and 2016, well above the growth rate of 0.6 percent from 1980 to 2006. The proportion of residents with unmet basic needs fell from 52 percent in 2006 to less than 36 percent in 2014. However, the government faced criticism for pushing through an extractivist agenda and not going far enough to put the rights of nature enshrined in the constitution into practice. The government’s relations to social movements and trade unions were fraught. Social movements opposed Correa’s rejection of a rapid transition from extractivism, which has long been a cornerstone of Ecuador’s economy. At the same time, some of the better-organized trade unions and social movement organizations that had gained niches of influence in the government before the Citizens’ Revolution, found themselves shut out of political decision-making under the Correa government. When Correa began to push through an anti-corporatist agenda, the most affected groups were elite representatives, but trade unions and social movements lost presence within the state apparatus as well. In response, these groups started to oppose the government. Beyond that, the Correa government’s confrontational style fueled conflicts with social movements. Government attempts to withdraw legal status from the environmentalist NGO Acción Ecológica certainly contributed to the narrative of an authoritarian government as well as government attempts to ouster the Indigenous CONAIE federation from its head office in Quito, allegedly due to continued violations of the legal terms of usage. While the Correa government denounced violence by anti-government groups, Indigenous and environmentalist movements saw government support for extractivism as the root cause for violence. Though in some cases these movements charged Correa with not going far enough, most saw his party as more supportive of the rights of nature than other parties, owing in part to social movements’ initial support for Moreno. The Citizens’ Revolution entered a difficult period in 2014, in part due to the crash in oil prices. Oil exports plummetedfrom about $13 billion in 2014 to little more than $5 billion in 2016. Total exports fell from $25.8 billion to just $16.8 billion. A devastating earthquake in 2016 worsened the situation. Due to dollarization, the government had less recourse for adjusting exchange rates. Credit requirements rose while interest rates for new loans increased. Ecuador’s economic output stagnated in 2015 and fell by 1.2 percent in 2016 according to ECLAC figures. Yet by 2017, the economy was growing again. The Correa government withstood pressures for more radical steps towards austerity that would have deepened the crisis. Instead, it developed creative mechanisms to withstand external shocks and stabilize the economy, for instance by making use of Central Bank loans to the government. Given the severity of the unexpected events and the limited capacity of a dollarized economy to respond, the economic downturn was surprisingly mild and short compared to previous crises. Despite that, Ecuador’s conservative opposition portrayed a supposedly large and unproductive state apparatus as the root cause of an unprecedented economic emergency. Though corruption in large infrastructure projects no doubt played a role, accounts in corporate media are exaggerated.In particular, opponents used the large scale corruption scandals surrounding the state-owned oil company Petroecuador and the Brazilian construction company Odebrecht to emphasize a narrative of a rotten state that begged a radical shift in the country’s development strategy. Once elected, Moreno declared that unlike Correa, he would fight corruption and reduce debts. By adopting the right wing’s framing, Moreno gave legitimacy to neoliberal policies and the return of business elites to the highest levers of state power. Net public debt, which is more telling than gross public debt figures, was still relatively low when Moreno took office. In May 2017 it had reached 27.7 percent, up from 12.2 percent in 2009, but still far from the 65.1 percent it had reached in 2000. In early 2018, Moreno gained support for institutional changes through a seven-part referendum, carried out in February 2018 without the approval of the constitutional court and lacking basic conditions of a fair process. Questions on the referendum were politically misleading: for example, it proposed to restrict the territory for additional oil production in Yasuní National Park from 1030 to 300 hectares. But the state-owned extraction company only planned to drill in 236 hectares of the national park even prior to the referendum, meaning the passage of that section of the referendum meant little in practice. Moreno also proposed to add close to 60,000 hectares to the zone as a way to cull support from environmentally-concerned or progressive citizens, while planning to loosen restrictions to oil extraction and tourism in the buffer zones close to the park. Meanwhile, the government’s attempt to repeal a Capital Gains Law revealed the new administration’s ties with the real estate sector. Without proof, the Moreno administration presented the law as responsible for a downturn in the construction sector. One of the main goals of the referendum, however, was to block Correa’s eventual return to power by banning reelection and to dissolve the Council for Citizen’s Participation and Social Control (CPCCS). The autonomous CPCCS was part of a transparency effort, responsible for appointing authorities to various federal, electoral, and judicial posts. The new government labeled it as too close to Correa and made it responsible for the selection of officials who turned out to be corrupt. Instead of trying to find ways to make it more autonomous, the referendum gave the executive branch alone the right to nominate the members of a new transitional council. The transitional council, CPCCS-T, was granted powers far beyond the constitution, justified as necessary to ffighting corruption. CPCCS-T president Julio César Trujillo oversaw the ouster of dozens of high-ranking officials in the Justice Department and state regulatory agencies, and appointed interim successors. In August 2018, the CPCCS-T purged the Constitutional Court judges, alleging that their predecessors in the original CPCCS had not acted independently when designating the judges. Although new judges have been selected in a questionable process, Ecuador has been without a Constitutional Court for months. Today, the Moreno government caters to the interests of rent-oriented sectors, whose influence the Correa administration had sought to curb, with some success. Although Moreno initially kept Correa’s economics team mostly intact, he has since replaced the remaining progressive economists with neoliberal ideologues and representatives of private sector interests. Most notably, Moreno appointed Richard Martínez, former president of the Ecuadorian Business Committee, as Minister of Finance in May 2018, marking a radical shift to the Right in comparison to Moreno’s first finance minister, Carlos de la Torre. While Martínez is Moreno’s third finance minister, he is the first to accept Moreno’s figures on the country’s debt. Moreno’s figure of about $60 billion in public debt is an exaggeration, as it includes liabilities such as fines from international arbitrations that are usually not counted as public debt, as well potential fines that may turn into liabilities in future. Moreno has used the calculation to accuse Correa of surpassing the official limit for public debt, which the Citizens’ Revolution set at 40 percent of GDP, which he used to justify another lawsuit against Correa. This, along with other actions, has undermined investors’ confidence in Ecuador’s ability to service its debt and increased the risk-premium for government bonds in spite of rising oil prices. This has limited the country’s ability to effectively restructure its public debt in a useful way.In February 2019, Ecuador reached a loan agreement with the IMF, alongside additional loans from the World Bank and other financial institutions. Information on their terms and conditions is still limited—but recent massive layoffs in the public sector could provide a first hint. Without winning an election, the economic elites and their representatives have gradually returned to the levers of state power as Moreno has appointed right-wing figures to top offices. After the elected Vice President Jorge Glas was removed from office and imprisoned on corruption chargesbased on shaky evidence, Maria Alejandra Vicuña became Moreno’s second vice president. Vicuña, a long-term supporter of the Citizens’ Revolution, a former parliamentarian, and a member of the leftist Bolivarian Alfarist Alliance (ABA)—a current within Alianza País—began to denounce alleged corruption within the Citizens’ Revolution, but was herself forced to step down over corruption allegations. She allegedly compelled her office staff in parliament to contribute a fraction of their salaries to her personal bank account, which she later declared was to benefit the ABA movement. In late 2018, radio broadcaster Otto Sonnenholzner was appointed Moreno’s third vice president. While Vicuña, whose leftist background did not inspire confidence in economic elites, had been elected by a narrow margin, Sonnenholzner received the support of Moreno’s Alianza País and the main right-wing parties. The parliamentary faction of the Citizens’ Revolution loyal to Rafael Correa voted against Sonnenholzner. What’s more, Vicuña’s corruption has apparently been used to provide cover for larger scandals, such as thousands of unauthorized bank debts for allegedly contracting insurance policies without clients’ consent or offshore funds allegedly used to furnish Moreno’s apartment in Geneva. The latter was the tip of the iceberg of a much wider scandal of bribes and offshore bank accounts surrounding Moreno. To protect the president, Ecuadorian institutions have so far blocked demands for an investigation of these events. Meanwhile, Moreno’s policymaking has severely affected the state’s capacity to monitor, control, and regulate private economic activities. After the 2018 referendum, the government started to propose and implement neoliberal economic policies more directly—namely through Moreno’s new economic policy, adopted in June 2018. Its measures include liberalizing foreign trade, introducing new tax exemptions, creating tax loopholes, removing barriers to capital flight into tax havens, and implementing austerity measures. The law prohibits the Central Bank from lending to the government, and requires public banks and social security to invest in private bonds and equities. The law also slashes any leeway in the field of monetary policies despite dollarization, an attempt to impose fiscal discipline. At the same time, the legislation includes an amnesty for billions of unpaid social insurance contributions and tax payments. Initially, Moreno’s turn against his predecessor appeared to pay off politically with a spike in approval ratings in his first months in office. He was able to rely on a broad alliance of left- and right-wing critics of Correa. Private media, profoundly hostile towards Correa, boosted his cause. Scandals, media spectacle, and a discourse of an oppressive state under Correa have enabled Moreno to dismantle the Citizens’ Revolution and undermined confidence in the public sector. Meanwhile, Moreno’s assertion that his government inherited a severe economic crisis and a highly indebted country is used to justify economic adjustment. For example, in late 2018 his administration increased the price of fuel, which may be a positive step environmentally in the long run, but in the short term will trigger growing discontent among the population and will weaken the purchasing power of Ecuadorian consumers. As Moreno pursues his conservative agenda, a growing number of social sectors have begun to distance themselves from the government. The government’s neoliberal policies have not thus far led to the promised economic success, and reflexive attempts to blame problems on Correa are losing effectiveness. The deterioration of social conditions that we have seen already is a warning that Ecuador is in danger of sliding back into the same kind of instability and political crisis that characterized the era before the Citizens’ Revolution. Timm Benjamin Schützhofer is a political scientist and holds a master's degree in global political economy. As part of his recently completed doctoral studies at Kassel University, he examines the fiscal policy challenges of resource-dependent states, using Ecuador as an example.